The ‘Superbad’ actor has shed weight and dramatically transformed his physique after gaining 40 pounds for a film role in 2016. Jonah Hill must really be feeling motivated in the gym these days. After debuting a much slimmer figure back in March, the Academy Award-nominated (Moneyball, The Wolf of Wall Street) actor has continued his weight loss quest. Three months later, Hill’s physique looks almost unrecognizable compared to his burly figure in films like Superbad, The Sitter, and This Is the End, making for quite the body transformation. 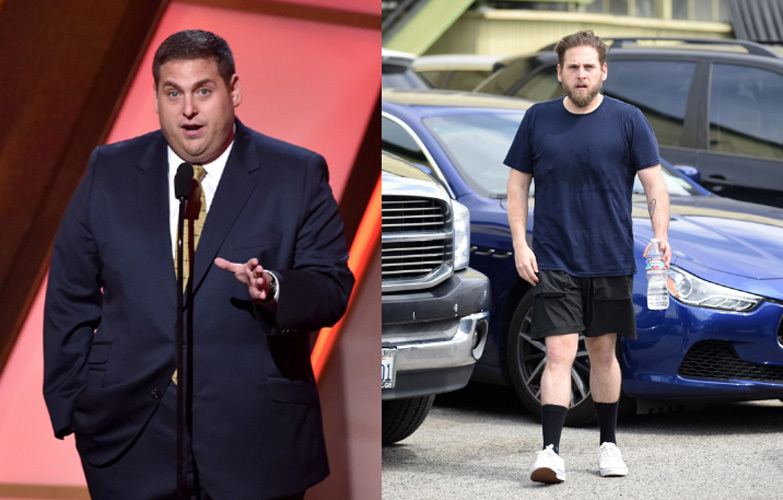 After debuting his lean and athletic figure in June, Jonah Hill has continued to keep himself in shape. Hill shows off some real solid muscle definition in his arms as he takes a walk in New York City on July 20, 2017. Hill shows off his more defined upper body and arms as he takes the streets of New York City on July 30, 2017. Jonah Hill has been working hard to get fit. Hill shows off his lean frame as he stops by The Erewhon to pick up a smoothie before a morning workout session in Los Angeles on June 16, 2017. Another look at Hill's dramatic weight loss on May 16, 2017 in Los Angeles. Hill is getting ready to film the Netflix show Maniac alongside Emma Stone. Hill in Noho on April 21, 2017, in New York City. Hill on the set of his first feature film as director. Wearing a Bart Simpson T-shirt (which reads "Lovin' Life, Man"), the 33-year-old star is at the helm of Mid '90s, which he also wrote. The film stars Michelle Williams and Lucas Hedges. Hill has been nominated for two Academy Awards, both Best Supporting Actor nods, for Moneyball and The Wolf of Wall Street. Hill shows off his arms in a tight-fitted T-shirt after his weight loss. Some of Hill's early roles included appearances in I Heart Huckabees, The 40-Year-Old Virgin, Accepted, and Knocked Up. Jonah Hill gained 40lbs to play Efraim Diveroli in War Dogs. Hill shows off his weight loss from March 2017. Jonah Hill starred as a fictionalized version of himself in the film This Is The End. Hill has a busy slate of movies coming up, including a potential third 21 Jump Street film with Channing Tatum.